There’s a certain science to HVAC marketing that doesn’t quite apply to most other industries: You need to be able to relate to the general public in a manner that’s warm and welcoming while showing your expertise at some pretty complicated (and necessary) processes. If you’re feeling overwhelmed at the idea of generating an HVAC marketing campaign that’s primed and ready for success, fret not! Our team at Continuity Programs has plenty of contractor marketing samples ready to help you fill your pipeline with new and returning customers for years to come! This 4-minute video gives a great overview and lots of examples. Know who your people are and understand why your most loyal customers love you. Every piece of information you can gather about your customers, from their address and services you’ve performed to their preferred method of contact and favorite season of the year, can help create strong relationships down the road. Our Intelligent Database Program uses a timeline to target customers you’ve recently interacted with, those you haven’t heard from in a few months, and everyone else to send relevant mailers. Be sure to ask about our complimentary company database evaluations. Get in touch with your community by targeting neighbors with eye-catching, high-quality mailers. Add a testimonial and include your logo to boost brand awareness. Top off your SurroundMail Radius Marketing efforts with a coupon for discounted service to entice customers to schedule an appointment. This is just the beginning! 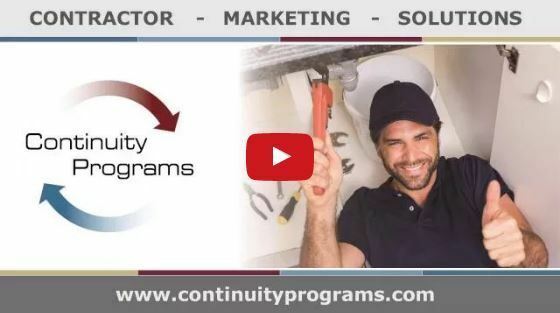 Check out this video HVAC Contractor Marketing Program Examples to get a firsthand look at some of the awesome elements the Continuity Programs team can cook up for your HVAC business! Here’s another resource you or your team may be interested in: 10 Tips on Keeping Good Techs Working in a Cyclical HVAC Business! Check out these ten powerful tips to help you keep good technicians.